Brown Algae have a lot of advantages. They require neither arable land nor irrigation, as they grow in salty coastal waters. There they also help to reduce the nutrients surplus caused by agriculture and above all our CO2 emissions. In addition, like all algae, they produce oxygen and they grow very quickly. The main components of the algae are the polysaccharides alginate and cellulose. When the alginate is extracted, it offers me a wide range of textile applications. The yarn I spun from the alginate is biodegradable. 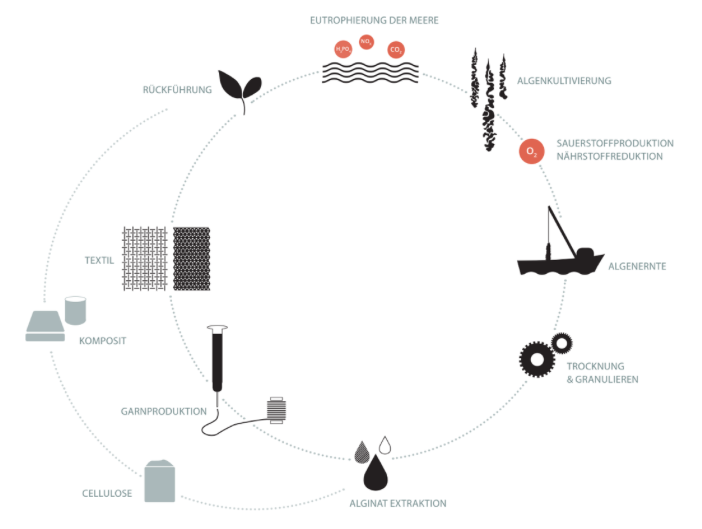 This makes up a closed cycle – from ecologically useful cultivation, through processing and use, to recycling. The big advantage is that brown algae are already cultivated and the alginate is industrially extracted. So far, however, it has only been used in the medical field or as a food additive as a thickener. In a circular economy, every single step, from the cultivation of raw materials to their disposal, must be equally taken into account. It is a big challenge. For comparison: cotton is not a “bad” material. It is a renewable raw material that is also biodegradable. However, it must be irrigated extremely much, grows only in very warm regions and a lot of pesticides are used. A similar principle applies to biodegradable plastics, based on cornstarch, which requires arable land and irrigation. All in all, many “sustainable materials” are not really sustainable. And that is perhaps the unique selling point of brown algae: they make sense to me from start to finish. I think the designer has the valuable quality of lateral thinking because he approaches things with an open mind. He does not see things from the point of view of a materials scientist, a biologist or an engineer. This may make him / her braver and more inventive. In any case, interdisciplinary work between science and design is absolutely essential.